So I said... That sounds like a cool thing, Id like to finish it off. A few weeks passed, and I said to myself there ought to be something like this already... but I found little that seemed like what I wanted... I did find OpenUniverse.org and it was good... Very good... But I couldnt figure out how to get it to render what I wanted, and the screen saver edition seemed buggy... So I had this wireframe code, a little real data, after fooling with it for a week, I was able to come up with a reasonably satisfactory simulation with solid spheres. Then I thought... It would be cool if I could get texture mapping to work... I already had the texture maps from OpenUniverse. Getting that to work proved to be much tougher... I couldnt figure it out with documentation on the internet... I looked at the OpenUniverse source, and it was just too much to be able to figure anything out from, so I kept looking on the Internet until I found the website of Richard S. Wright, Jr. He had written a book titled OpenGL SuperBible... I looked at what he had online, and it was EXACTLY what I thought I needed, In fact I was so impressed, I bought the book within 24 hours of finding his website. A bit more work, and I got the texture maps working... then I made it into a screen saver. Now it was quite obvious to me that ACTUAL SIZE wouldn't be very entertaining... so I put a lot of effort trying to figure out the optimum distortion of the size of the planets to the size of their orbits. It occurred to me that a user might not prefer my selection, so I came up with a sliding distortion algorithm, and made it user selectable... So now it has a Settings panel, then it seemed like one setting after another got moved from being hard coded to the Settings panel. Get more, newer, or higher resolution maps at: http://maps.jpl.nasa.gov/ ...Or click on the download button to get a large variety of planetary images. The addition of the stars and asteroids have helped to improve the sense of dimension. The star database contains 118 thousand stars from the Hipparcos star catalog. The asteroid database contains the 6 thousand largest asteroids listed by Edward Bowell of Lowell University, each with its correct size and orbit computed. Currently I'm working on adding comets to the program. If you have a request, suggestion or information that would improve the simulation, drop me a note at webmaster@3dsolarsystem.com. This is a public distribution please feel free to distribute this as widely as possible... Hurry while it's still free! No fields are required to be filled out. wish to submit accurate information. 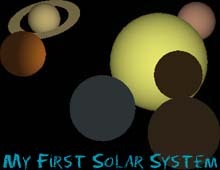 All the images of celestial bodies on this page were rendered by 3DSolarSystem except where noted. otherwise, the Sun will continuously be the focus of the camera. Selects the speed that the camera approaches the bodies. Selects the speed that the camera rotates around the focus. This rotation is independent of the orbits of the planets, but can create the illusion that the planets are orbiting faster than they actually are. A setting of Fast Orbit could cause dizziness. This choice will display a Legend showing information about the body in focus. Sets the size of the planetary bodies, Small Bodies renders the planets at the small sizes that most accurately represents their true sizes. 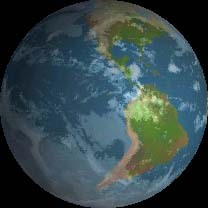 Large Bodies can be selected to magnify the size of each planet, and render more detail. Controls the relative size of each planetary body to the others, at Normal Ratio, the relative sizes will be acurate, at LogRatio, the sizes of the planets will be closer to the each other, but the largest will still be larger than the smallest. This control affects the speed at which the planets rotate around their own axis. If Planet Normal Rotation Speed and Orbit Speed Normal are both set, then the rotation and orbits will be correct relative to each other. This control is primarily to affect the speed that the video card can draw the planets. A choice near Octahedron will render the planets with very few sides, while a choice near Sphere will render the planets with very many sizes. This choice provides a way to trade off computer performance versus visual clarity. If this control is selected, a the rings of Jupiter, Neptune and Uranus will be rendered. Actual Size attempts to show the orbits at their correct relative sizes. Distort Orbits shows the orbits as if they were all equally spaced. Note: As the Planetary body size increases, the Orbits are distorted in order to accommodate the size of the Planet, so that if the Planet sizes are not set to Small Bodies, then some distortion will always occur regardless of this setting. Controls the speed at which the planets travel around the sun. If Planet Normal Rotation Speed and Orbit Speed Normal are both set, then the rotation and orbit speeds will be correct relative to each other. Controls how bright the Celestial Grid, Orbital lines and Clock Hands are drawn. the slider can be set toward Eccentric to exaggerate the Eccentricity of the orbits. The Eccentricity will also exaggerate the speed of travel along the orbit, with the planets traveling faster at their closest approach to the Sun. This can result in the more eccentric orbits crossing orbits that they do not actually cross. may be helpful when Small Bodies is selected. If this control is selected, a the planetary bodies will be rendered as lighted solid objects, if the computer is slow, this setting may not be desireable. This controls the number of Asteroids drawn. A setting toward Many Asteroids will draw the 6000 largest asteroids. When the program begins, it will not have calculated the orbits of the asteroids, asteroids are added to the rendering as their orbits are calculated. The ideal setting for this control will depend both on individual preference, and computer performance. Controls the number of stars rendered by the program. A setting toward Many Stars will draw the complete database of 118,000 stars. The ideal setting for this control will depend both on individual preference, and computer performance. Shows the Celestial Lattitude and Longitudes. Freeze Frame will hold each image for a full second. Full Motion, will attempt to display 60 frames per second (actual performance will depend on the individual computer). Smooth animation will be achieved between 15 and 30 frames per second. The bottom left corner displays the frame rate in Frames Per Second. Opens a list of settings and commands. The most accurate display can be achieved by setting: Planets: Small Bodies, Normal Ratio, Normal Rotation; Orbits: Actual Size, Normal, Eccentricity Normal. However this display is generally not helpful for visualizing the Solar System. The most entertaining display is not the most accurate.